This week�s Kpreps.com rankings include movement in each 11-man classification as five ranked teams lost during Week 3. The Kpreps.com rankings are a collaboration of multiple media sources across the state released each Monday throughout the season. �Let�s take a look some of the changes for Week 4 of the Kpreps Top 5 rankings, powered by Pinamonti Physical Therapy. Perhaps the two teams that appear most vulnerable near the top of any poll are No. 1 Shawnee Mission West and No. 2 Lawrence Free State in Class 6A.� The top-ranked Vikings needed an Andre Maloney touchdown with 13 seconds left to edge winless Lawrence 14-31, while Free State rallied from down 20-7 to hold off Olathe East 28-26.� The Vikings and Firebirds square off this week in the marquee game in the state pitting No. 1 vs No. 2. Elsewhere in 6A, Hutchinson fell two spots to No. 4 after the Salthawks were beaten 41-7 at powerful Rockhurst (Mo.) on Friday night.� Derby moves up one spot to No. 3 after destroying previously ranked Maize 62-13, and Topeka High enters the poll at No. 5 after beating Topeka West. In Class 5A, the changes occurred at the bottom of the poll as Blue Valley moved up one spot to No. 4 after an impressive 35-28 win over Salina South.� The Cougars have gone from No. 1 two weeks ago to outside of the rankings after consecutive losses.� Hays enters the poll this week at No. 5 after outscoring Liberal, 52-38. The top three teams, Bishop Carroll, Bishop Miege, and Blue Valley West, remain unchanged. 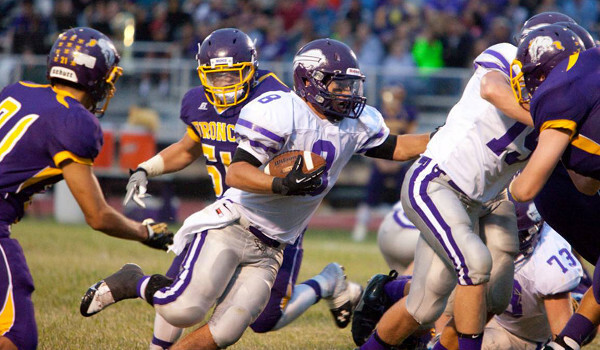 The only change in this week�s 4A poll has Baldwin and Eudora swapping places at No. 3 and No. 4, respectively.� The Bulldogs were impressive again in scoring on eight of their first nine possessions in a 58-18 win over St. James Academy, while Eudora needed a fourth quarter touchdown to edge De Soto, 7-0. Defending champ Scott City survived a scare from Heath Tucker and Holcomb by scoring 10 points in the fourth quarter to win 31-28.� The Beavers remain at No. 3 in the Class 3A poll, just ahead of Central Plains League rivals Conway Springs and Garden Plain.� The Cardinals rolled Wichita Independent 64-6, while the Owls beat Belle Plaine 43-12.� Sedgwick fell out of the top five after a 62-48 loss at unbeaten Sacred Heart.� No. 2 Beloit hosts that dangerous Sacred Heart team this week. Oakley allowed its first points of the season in a 14-6 loss to Phillipsburg in Week 3.� The Plainsmen are down two spots to No. 4 in the Class 2-1A poll.� La Crosse and Meade move up to No. 2 and No. 3, respectively, while Centralia still is the favorite in the top spot.� The Panthers have yet to allow a points this season, and even more impressive, have yet to allow an opponent reach 100 yards of total offense in any game this season. No changes occurred in either 8-Man poll this week.� Top-ranked Madison had no trouble with Hartford and Trever Powell rushed for 265 yards and three scores as Kiowa County outscored Macksville 70-32.� Osborne, Marais des Cygnes Valley, and Atwood-Rawlins County each posted blowout wins in Week 3 to round out the Division I poll. In Division II, top-ranked Baileyville B&B was impressive on Thursday night in blanking a traditionally strong Pretty Prairie team, 50-0.� Thunder Ridge remains at No. 2 after six total touchdowns from junior Trent Rietzke, and Hanover and Sharon Springs-Wallace County each posted shutout wins.� Victoria remains in the No. 5 spot after beating defending 8-Man, Division I champion Ness City 42-14.� The loss snapped the Eagles� 15-game winning streak.� Victoria will face another strong test in Week 4 when the Knights travel to take on unbeaten Central Plains.